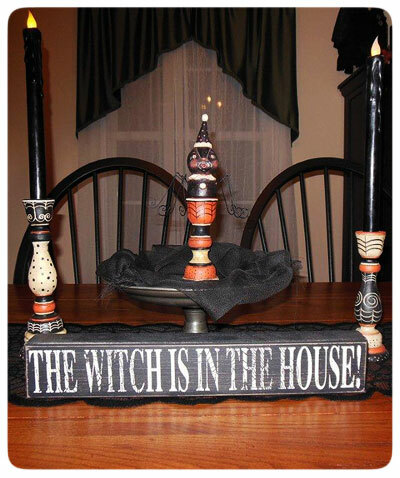 Donna: I found your art looking at pictures of Ghoultide Gathering in 2011. It was love at first sight! 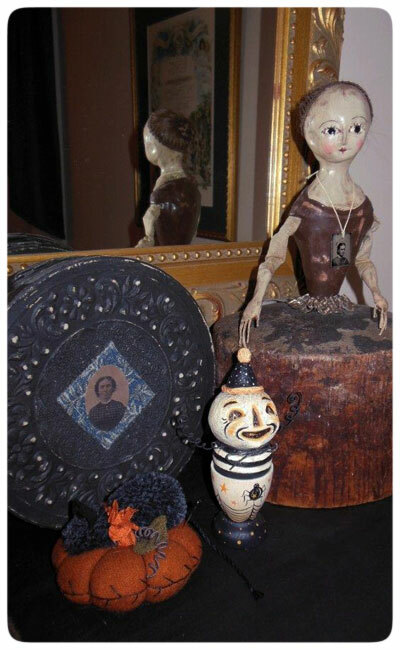 J: Well, I am thrilled that you were perusing photos from the Ghoultide art show and that you spotted my papier mache folk art characters! 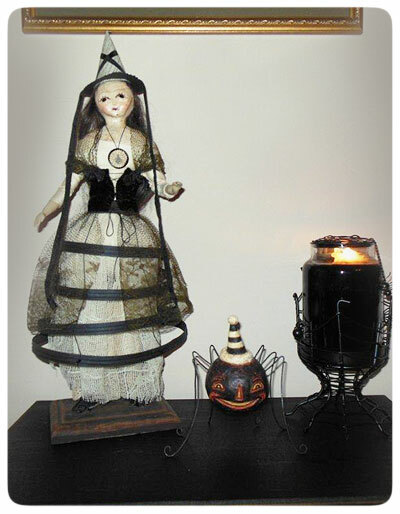 Donna: I bought my first original in 2011 from your Halloween Web Sale, a few weeks after discovering your art. 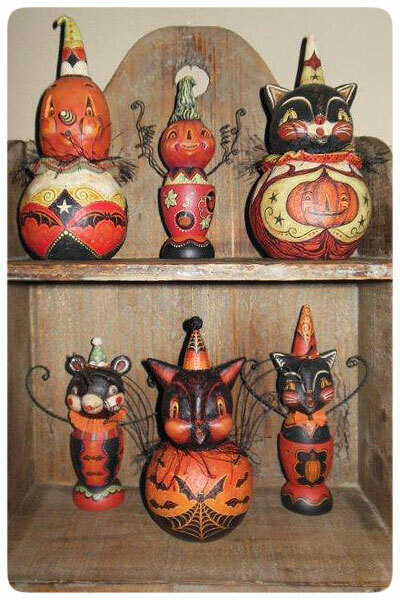 * What a colorful grouping of Johanna Parker Design Halloween folk art characters! 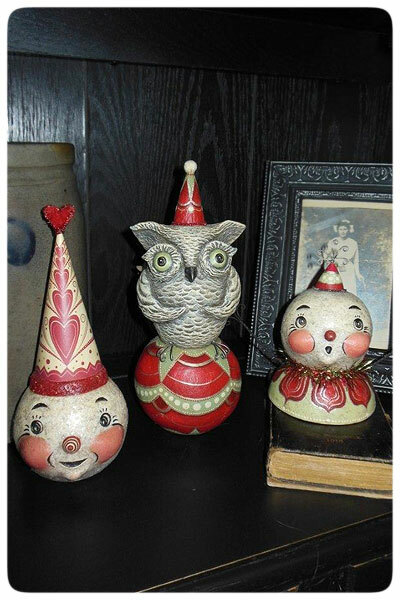 It is reminiscent of a spooky carnival and a pleasure to see them all grouped in one place! J: What is it about my creations that capture your imagination? 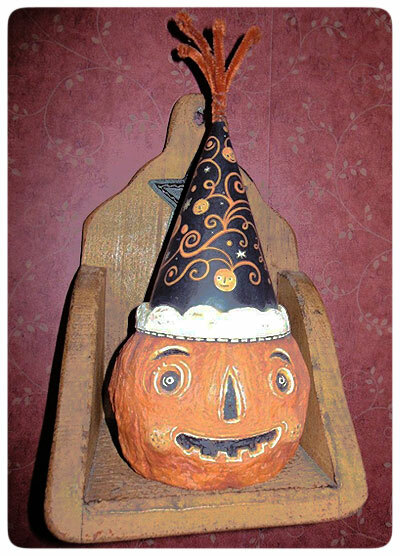 Donna: Halloween has always been my favorite Holiday. 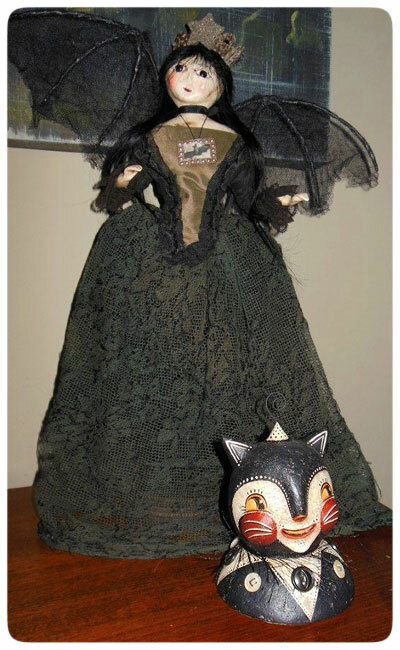 I am especially drawn to vintage Halloween items and your originals capture that vintage look. Just holding one of your originals in my hands is a magical experience for me. 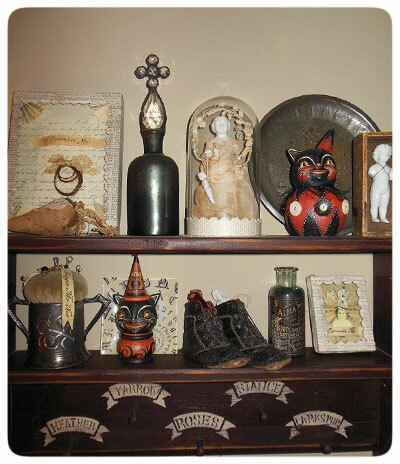 I love how each piece has it's own personality. 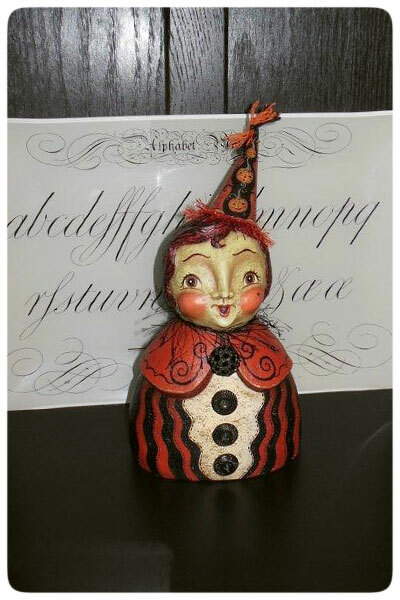 I love the texture, the artwork and the little embellishments that you add to each piece, such as glitter, bowties, collars and wire. 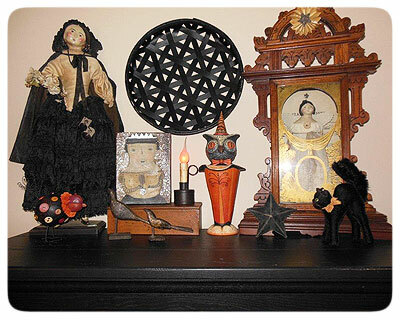 It all combines to make each piece entrancing and instantly takes me to my "happy place". J: Thank you for being so observant and appreciating all the little extra details that I add after painting each original piece. It's like the icing on the cake, which takes me to a happy place too! 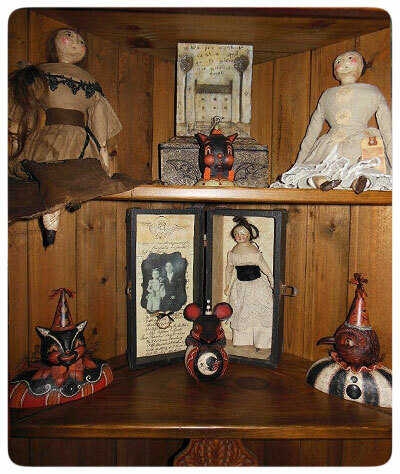 * Above, my mini bat bust with wire accents and bow tie trims captures some of those fun embellishments that take Donna to her "happy place!" 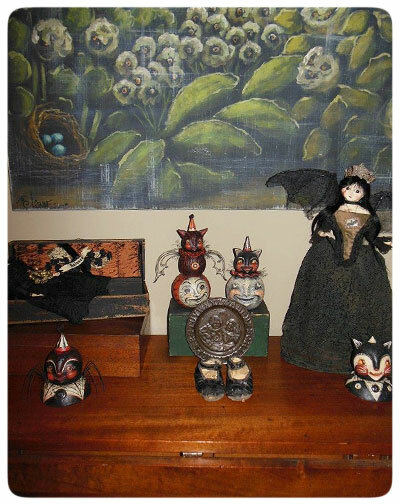 A small Laurie Meseroll primitive painting serves as a sweet backdrop for this Johanna Parker Design bat in the foreground. 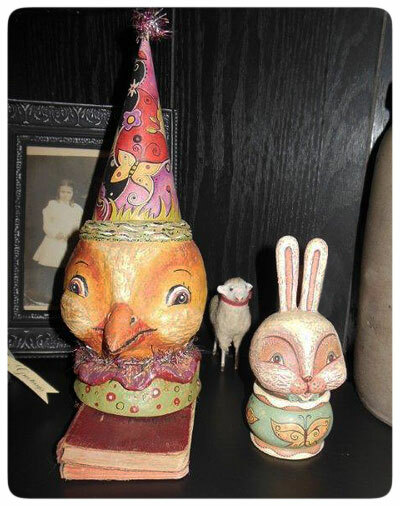 Donna: I just attended my first trunk show in Denver, and I lost control of my hands - I bought seven originals! I was asked numerous times, "How many are you buying?" LOL I have an extreme fear of flying, so just showing up was huge for me. I did not want to waste the opportunity to purchase as many originals as I could, as I may never get my up my nerve to fly again! I would have to say, your shows are the ultimate buying experience! I have also had equal success with Collector's Catch, web sales and eBay. J: Well, it was quite a treat for me to meet you in person, and I am so honored that you made the journey to collect my art, despite your fear of flying...(I'm not a fan of flying either!) I am happy that your buying experience was fruitful... Your loss of hand control made me laugh out loud! 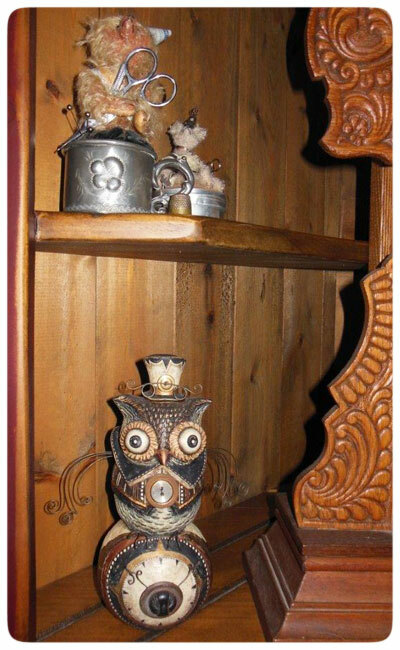 * Donna has an eye for assembling and arranging her antique finds and folk art objects that creates a nostalgic experience and a sense of treasures found! Donna: That is a tough question for me to answer, as I love all my JP originals. I would have to say that "Morty Moonsquat" is my favorite. He flew so high, he landed on the moon, quite by accident. He is a reminder to me to keep myself "grounded". 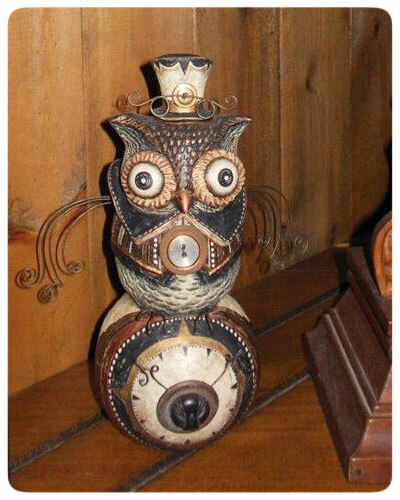 "Timely Timowlthy" is a very close second. 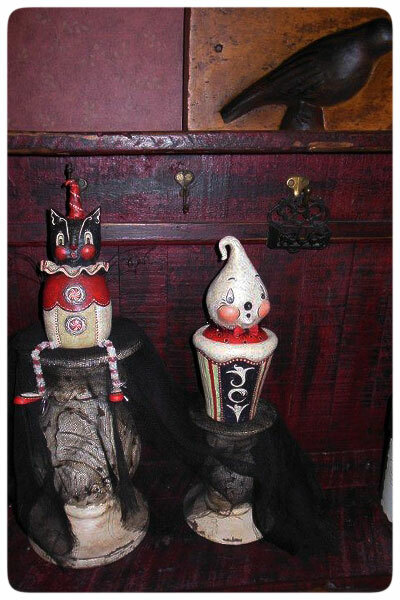 * At left is "Morty Moonsquat", a special order piece that Donna convinced me that she needed!... According to Donna, I captured him just as she imagined! Yay! 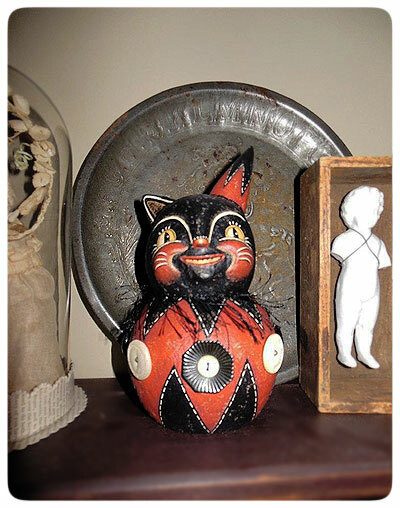 And, he pairs nicely with the cat/moon ball character that she collected from me last year... 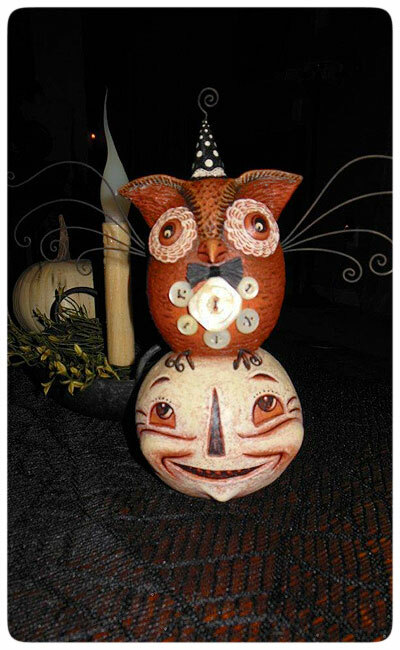 Both Halloween ball characters are by Johanna Parker Design. Donna: I am so happy you asked. I have several suggestions! 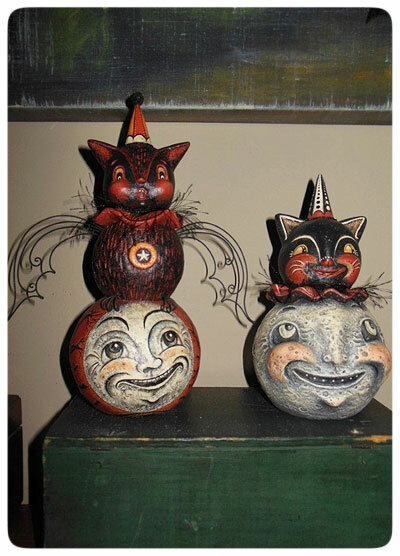 For Halloween I would love to see a zombie or a devil. For Christmas I think an elf would be delightful. J: Thanks for the ideas! I have never made any of the 3 you mentioned, but I do have some elves slated for this year's Holiday Open House - well as long as I like how they turn out! 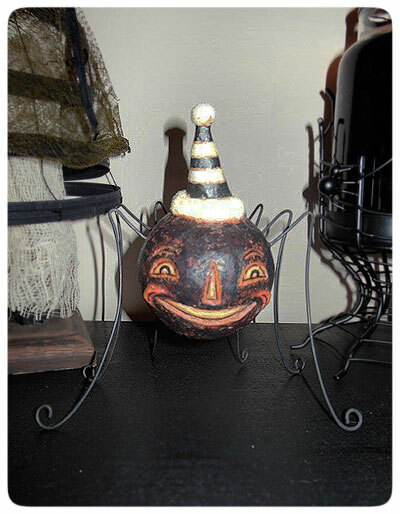 * Donna found this early jack-o'-lantern of mine on eBay. 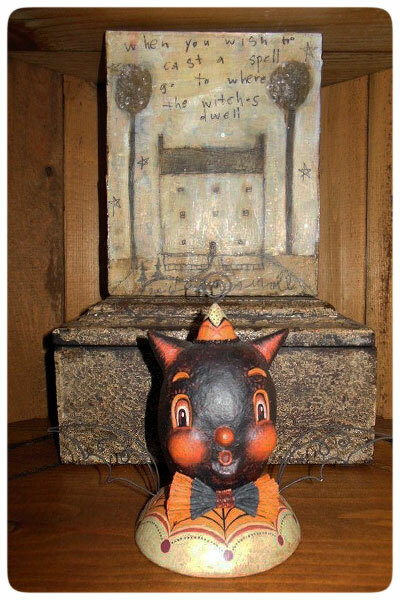 He is likely dated 2004 and was created when I was still exploring my technique and deciding IF I wanted to follow along on this folk art path! 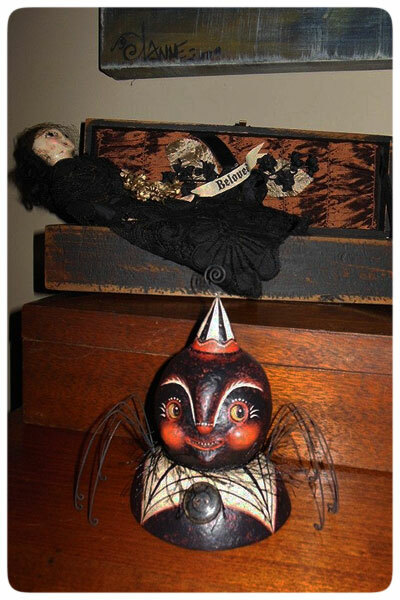 * Taking a closer peek at the Johanna Parker Design spider reassures us that he is indeed a friendly fellow... Thank goodness!!! 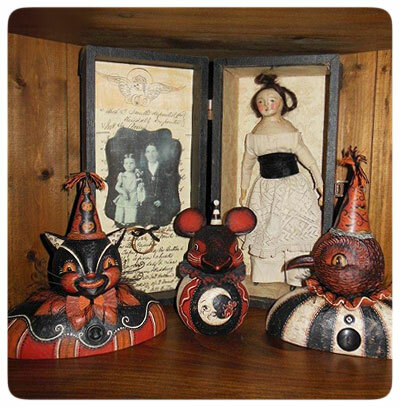 * Donna also shared a few other Johanna Parker Design holiday characters! 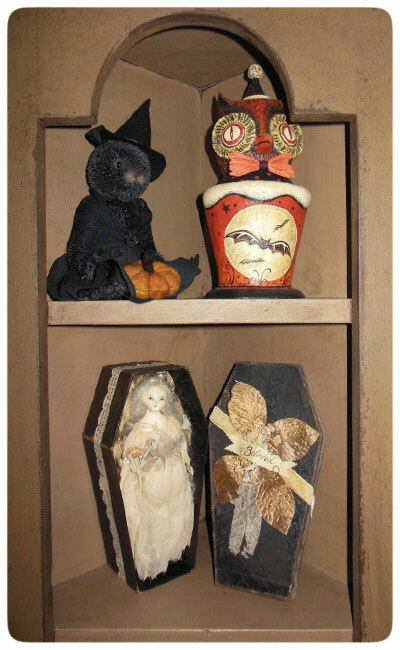 From 2011 & 2012, these two Christmas cross-over pieces bring a hint of Halloween whimsy to her decor. 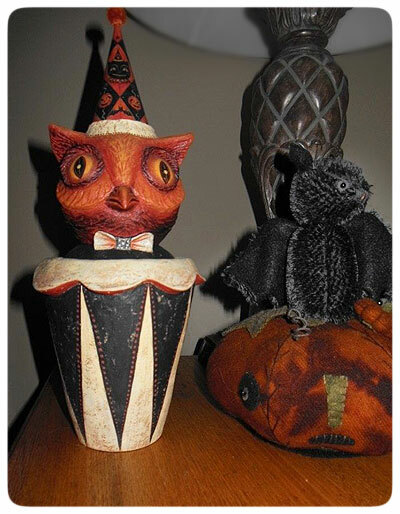 My holiday Bat Sitter and Ghost of Christmas past candy container are both elevated upon pedestals and make us smile! 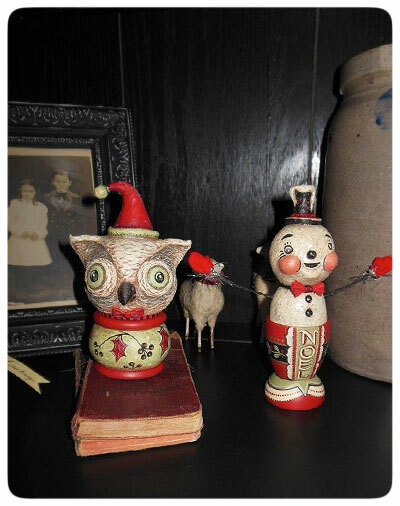 * Two snowmen surround a perching owl, all decked out for the holidays. 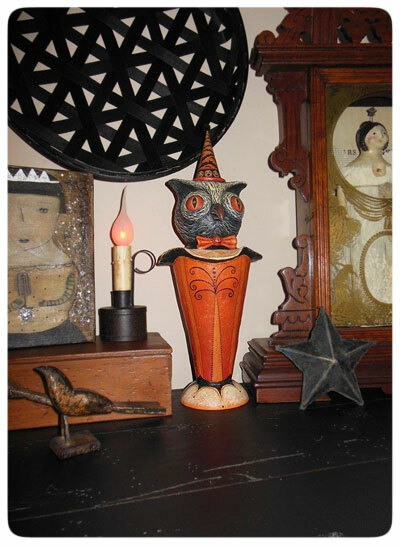 Again, these originals by Johanna Parker Design partner well together and amidst the antique treasures in Donna's home. * And, let's not forget about Valentine's Day! 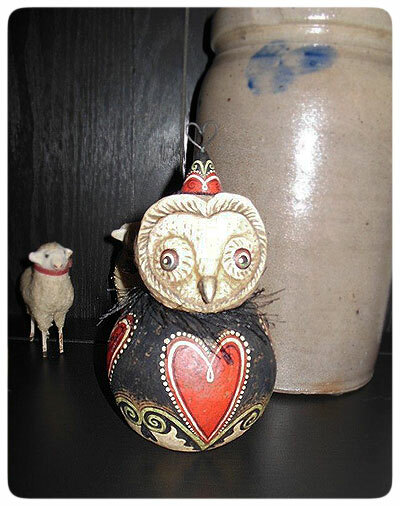 During a web sale, Donna snagged this special heart-shaped barn owl piece that I created for the month of love! * And last but not least, Donna shared a peek at a pair of spring-themed Johanna Parker Design originals. 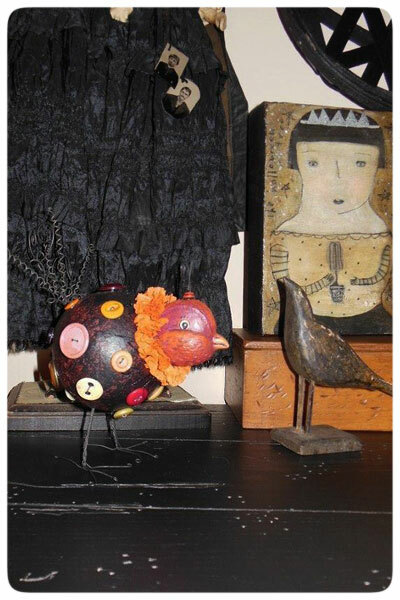 The party-style bird is a much earlier piece that she found on eBay. The white hare kettle cup was included in a collection of originals made for my spring web sale in 2012. I hope you enjoyed Donna's photos! 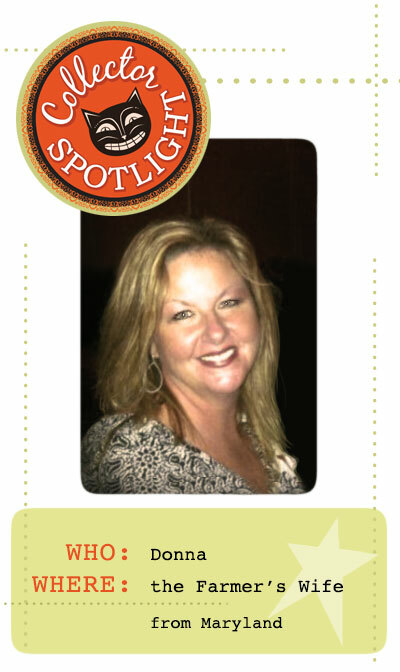 You can share your thoughts with Donna here in the comments portion of this post. Just click the "comments" link below to leave a message for both me and her! 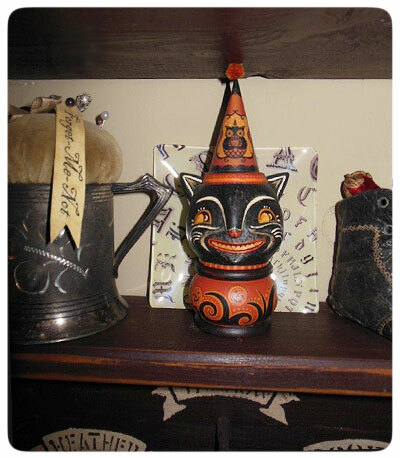 HAPPY HALLOWEEN & Happy Collecting too!